This carefully crafted ebook: “Great Expectations (Unabridged with the original illustrations by Charles Green)” is formatted for your eReader with a functional and detailed table of contents. Great Expectations is a bildungsroman, or a coming-of-age novel, and it is a classic work of Victorian literature. It depicts the growth and personal development of an orphan named Pip. 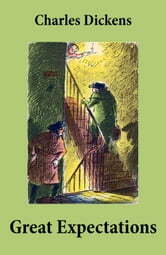 The novel was first published in serial form in Dickens' weekly periodical All the Year Round, from 1 December 1860 to August 1861.